Posted in General Health & Wellness on April 18, 2011. Last modified on April 23, 2019. Read disclaimer. How much time did your kids or grandkids spend in unstructured, outdoor play this week? If they're like most kids, it could've been less than seven minutes per day! In fact, kids are spending half as much time outdoors as they did 20 years ago. On top of that, 8 to 18 year-olds spend an average of 7 hours and 38 minutes using entertainment media each day; this includes TV content, music/audio, computers, video games, movies and print. That's according to a study on the changing times of American youth published by the University of Michigan Institute for Social Research and confirmed by a paper on Generation M (for Media) by The Henry J. Kaiser Family Foundation. However, lack of outdoor play takes both a physical and mental toll on today's kids. Decreased time outdoors is not only associated with increasing obesity, but also with declining creativity, concentration and social skills. According to the American Academy of Pediatrics, 60 minutes of daily unstructured play, at least 5 days a week, is essential to children's physical and mental health. The move to an indoor childhood is negatively impacting the health and wellness of today's children. Now's the perfect time to get kids outdoors and re-introduce them to the joys of the natural world. Join your kids or grandkids in their rediscovery; after all, everyone needs to play! Their -- and your -- health may depend on it. With all its benefits, outdoor play comes with safety considerations. 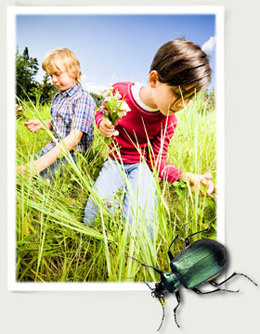 Insect protection: Mosquitoes, fleas and ticks are all capable of transmitting diseases to humans. Use appropriate insect repellent according to label directions. (While DEET is the most proven insect repellent, lemon eucalyptus oil is listed with the EPA as a natural yet reasonable alternative.) Check yourself and others for ticks and shower as soon as possible if you've been in a tick-infested area. Also be on the lookout for wasps, bees and other stinging insects. Avoid snake and spider bites: There are approximately 50,000 snake bites in the US each year, with the majority of these occurring to people who are either trying to catch or kill the snake. Of these bites, about 1 in 6 are from poisonous snakes. Fewer than 10 people die from poisonous snakebites in the US each year. To prevent snake bites, don't put your hands or feet where you can't see and, if you see a snake, leave it alone. The same precaution applies for black widow and brown recluse spiders. When outdoors or around abandoned or seldom-used buildings, watch where you're sticking your hands or feet. Learn how to recognize poisonous ivy, oak and sumac. Practice good hygiene. When packing meals and eating outdoors, wash hands and keep utensils clean. Keep perishable foods cold until eating. Never let kids play with wild animals which may have rabies or animal feces which can spread diseases linked to parasites. Stay hydrated and be watchful for signs of heat-related illness. To prevent drowning, teach kids how to swim at an early age and keep a close eye on everyone in or near the water. Toddlers under age 4 can drown in as little as an inch of water. Also, be aware that any recreational water, be it lake, stream or ocean has the potential to be contaminated with toxins (especially after heavy rains). And even pools can contain and spread illness-causing germs and parasites. Lastly, watch the weather. Get out of the water if lighting is a possibility. Wear appropriate safety gear such as a helmet when biking, skateboarding or roller blading. Protect against harmful UV sun rays: To avoid sunburn and potential skin cancer risk later in life, stay out of the sun during the hottest hours of the day (10 a.m. - 4 p.m.), wear sunglasses and a wide-brimmed hat that protects neck and ears. Use SPF 30 sunscreen liberally and reapply every 2 hours and after swimming or sweating. Don't forget UV protective lip balm. These guidelines apply on cloudy days, too. Just a single sunburn that's bad enough to blister can double a person's lifetime risk of developing skin cancer. Dress to stay warm and dry: Wearing layers of clothes permits you to remove garments as your body heats up from activity or temperature changes. You want to avoid becoming wet from rain, sleet or even sweat. Outer layers should be rain and wind resistant while inner layers should be made of wool, silk or polypropylene (which retain heat better than cotton when wet). Shivering is a sign that you're losing heat. To avoid developing hypothermia, stay hydrated and keep your energy level up by eating regularly. We often think of hypothermia as being a concern only in extremely cold weather but it can occur at temperatures above 40°F, especially if a person gets wet. Learn how to recognize the symptoms of hypothermia. Ears, cheeks, nose, chin, fingers and toes are susceptible to frostbite if not protected from freezing temperatures. As with hypothermia, frostbite can occur without the victim even realizing it. Know the symptoms of frostbite. Even in winter, you still have to be careful of the sun's UV rays: Just like sand and pavement, the snow reflects up to 90% of the sun's harmful UV rays. Regardless of the season, use common sense -- never play or hike outdoors without telling someone where you will be, keep an eye on each other when you are out, and take a cell phone in case of emergency.